Striles Doug Maat explains airTec hot air technology edgebanding. Compressed hits the edgeband at about 500 degrees to activate a glue layer - but rapidly cools after, to 120 degrees when it exhausts. About 100 wood products executives braved the winter elements to attend Stiles Machinery's workshop on zero edge technology. Anthony Striker (from left), Richard Stokes and Whitney Stokes from Spyker Manufacturing, Defiance, OH, attended the Stiles workshop. Checking out the Brandt edgebander as part of Stiles Machinery Sharpen Your Manufacturing Edge workshop. The demo center allowed a closer look at the woodworking machinery in operation. Author selfie backed by the crowd at Stiles Sharpen Your Manufacturing Edge session. After a learning center presentation on laser and hot air edgebanding the group at Stiles moved into a demo area to see the Homag laserTec running live. 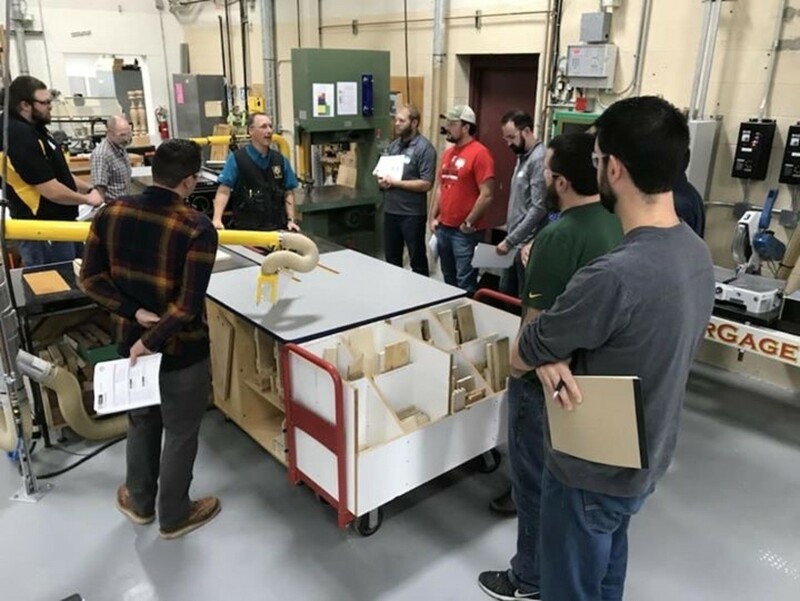 GRAND RAPIDS, MI - Technology for zero glue line edgebanding and robotic materials handling are proving strong draws, as about 100 wood execs braved winter weather to attend Stiles Machinery's "Sharpen Your Manufacturing Edge," a day-long education event that started today. 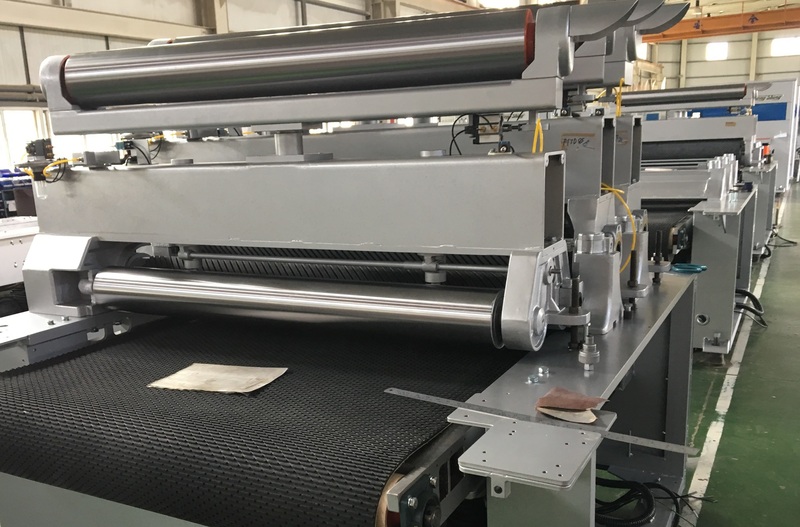 Attendees from around the country are seeing two approaches to the zero glue line edgebanding, which lays down specially converted edgebanding materials incorporating an adhesive layer. The Homag laserTec edgebanding system use laser beam energy to activate the glue and fuse it to the panel edge. The Brandt airTec edgebander uses next-generation approach to concentrated hot air to energize the adhesive. In separate sessions, woodworkers are seeing live demonstrations of the Bargstedt IntelliStore Material handling capabilities. Going through its paces, the IntelliStore system uses a gantry-mounted vacuum lift wood panel or other material from storage to production line. The intelligent system allows for even tighter panel storage, since no forklift lanes are needed to access the panel materials. The system demos are mesmerizing, as the "smart" storage system rapidly moves from point to point - loading raw material into and in between the production lines - panel saws, and other operations. Ken McFadden, product manager of Bargstedt, said Stiles Machinery has installed nine IntelliStore units so far. They are in use in both commercial and residential cabinetry settings, in office furniture production, store fixtures as well as architectural millwork. Six of the companies have the IntelliStore integrated to production processes, feeding panel sales or CNC machines. Three use it simply for materials handling and inventory control. McFadden said the smart storage and retrieval system learns from past activity as it operates. Thus it is able to place frequently requested panels in easily accessible locations. In one application, McFadden said IntelliStore keeps all FSC-certified panel separate from non-FSC certified panels. IntelliStore tracks incoming material and associates it with the original purchase order. As a result, "If you have a supply issue ... you now have a way to track the origin of a specific panel," McFadden said. Stiles will feature live demonstrations of the system at IWF 2014 in Atlanta. Doug Maat, Homag product manager, presented laserTec edgebanding technology, as well as the new airTec hot air edgebander introduced at LIGNA last May. 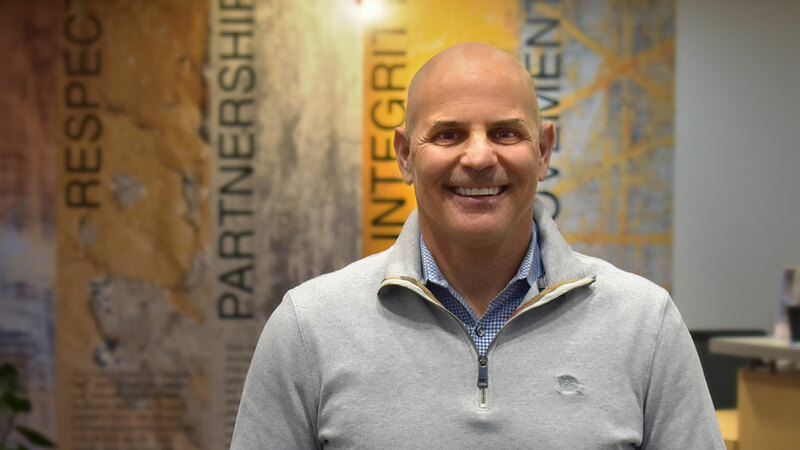 "This is potentially the most significant development in edgebanding since hotmelt dispersion adhesives," Maat said. Stiles' term "zero glue line" embraces both technologies. Laser edgebanding was introduced in 2009, and now dominates production in Europe and Asia. Its adoption in the U.S. has been more gradual, and the cost is significant - it is a $300,000 retrofit. It is available on Homag edgebanders. The airTec technology, available on both Brandt and Homag models, is more compact and less expensive. "I think this is going to be the heart of the industry," Maat added. "An every man's machine." The airTec technology costs $45,000 to retrofit and fits Brandt 1400, 1600, and 1800 series, plus most Homag edgebanders. He said airTec requires about 20 minutes of heat up time at the start of the day's first shift, but after that it goes on and offline quickly. Workshop attendees also toured Stiles Machinery's recently expanded Grand Rapids showroom, and its bigger educational training center.